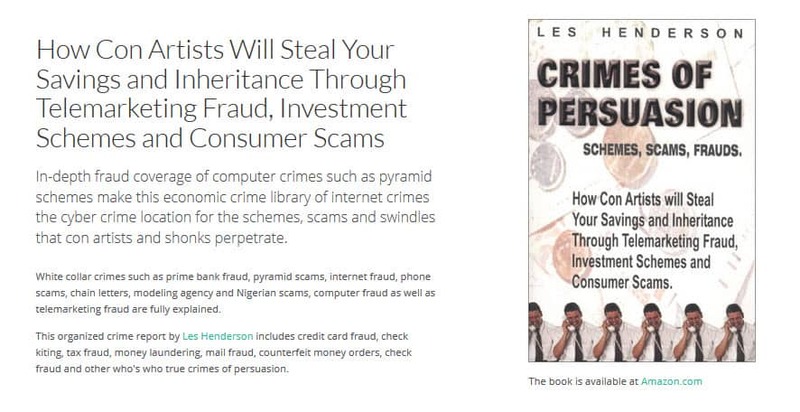 Crimes of Persuasion: Nigerian scams, pyramid schemes, consumer frauds. To inform the public, along with law enforcement personnel, justice officials and victim support groups on the workings and scope of telemarketing and investment fraud so that efforts can effectively be taken to minimize the impact on its victims and ensure that adequate penalties are in place to deter the perpetrators. Although funded by myself as a public service, support through book sales, sponsorships or donations is greatly appreciated. If you invest some time searching and viewing this site, I will show you, in great detail and with many real-life examples, "How Con Artists will Steal Your Savings and Inheritance Through Telemarketing Fraud, Investment Schemes and Consumer Scams." My in-depth coverage of Internet crimes, phone scams and pyramid schemes, which has been online since 2000, makes this the largest and longest running cybercrime library of the scams that con artists perpetrate both online and in person, despite the many attempts to take the site down through litigation. Please just note that because the site has well over 500 pages of content, the best way for you to find just what you want is to do a search using forms at the top or bottom of any page. Prime bank fraud, Ponzi schemes, door-to-door scams, internet fraud, chain letters, modeling agency tricks, Nigerian scams, computer hacks, as well as a multitude of telemarketing fraud variations are all fully explained. If you start with the premise that it is almost certain that you will be a victim of fraud during your lifetime — for it is not just the greedy and the gullible who fall prey to these deceptions — you might just avoid becoming yet another victim. The unwary, the trusting, and especially the elderly, are targeted by both small and large-scale fraud operations which steal an estimated $45 billion dollars per year in North America alone. You will be overwhelmed by the many variations of scams, which I have condensed from the court transcripts of multi-million-dollar fraud cases, as well as law enforcement advisories, into a clear and entertaining format. You might even marvel at the audacity, and shudder at the heartless greed, of these scammers who successfully and profitably portray themselves as reputable investment brokers, business opportunity franchisers, sweepstakes operators, lottery vendors and loan brokers. The only protection you and your parents have is to fully understand how these various scams operate before they strike. My book and this website go into great detail exposing con artists for what they really are, criminals without a conscience. Please take just a few hours to learn how to save yourself and your inheritance, then pass on the book, or a link to this website, to a friend. Do whatever you possibly can to help stop these financially and emotionally devastating crimes by at least informing yourself of the risks that await you. This detailed, but easy to understand, report on organized white collar crime topics includes credit card fraud, check kiting, tax fraud, money laundering, mail fraud, counterfeit money orders, check fraud and other true crimes of persuasion. The types of telemarketing fraud covered, which tends to target seniors, includes Sweepstakes Scams, 1 of 5 Prizes Sweeps, Advance Fee Sweeps, Gimmie Gifts, Lotteries, Magazine Subscriptions, Reloading, Recovery Scams, Charities / Donations / Fundraising Scams, Senior Victims, auto-dialers, call centers, mooches, rip and tear, and other telephone marketing scams. The varieties of investment fraud covered in a special section of its own include shares scams, affinity fraud, blind pools, commodities, futures, options, films, foreign currency, FOREX, gemstones, FCC licences, high tech, resources, promissory notes, prime bank, real estate, T-bills, bonds, CD's, GIC's, viatical settlements and other wacky wonders from share pusher boiler rooms. Business opportunity scam topics include medical billing services, display racks, inventions and patents, vending machines, vanity press publishing, poetry contests, bulk e-mail and matrix scams. The section on Money Problem Scams covers Bankruptcy Advice Scams, Bogus Credit Analysis, Scams with Credit Cards, Credit Repair Schemes, Credit Report Tricks, File Segregation Misrepresentation, Identity Theft, Dishonest Loan Brokers, Secured Credit Card Fraud. The Work-at-home scams to make money section covers Assembly Projects, Product Testing, Reading Books, Stuffing Envelopes. The Street Scams section covers Bank Examiner Fraud, Pigeon Drop, Jamaican Switch, Melon Drop, Fortune Tellers, Distraction / Impostor Burglary, Door-to-Door Scams, Coin Con, "White Van" Speaker Sales, Car Buying Scams. The section on Consumer scams / Economic Crimes relates to issues about Chain Letters, Internet Fraud, Credit Card Insurance, Home Equity / Home Renovation, Cramming ( 800/900 numbers ), Pay Per Call, Pyramid Schemes, Local Pyramid Clubs/ Dinner Party / Gifting Clubs, Multi-level Marketing / MLM, ACN Scam?, Talent Scout / Modeling Scams, Time Shares / Travel Clubs, Travel & Vacation Offers. The section on Fraudulent How-to manuals covers Abandoned / Lost Money, Employment offers, Government Auctions, a purported fast-track Green Card Lottery scam, Inheritance Tricks, Missing Person Hoax, Bogus Scholarships / Diplomas. Reviewing the techniques used amongst each of the many scam variants often shows how these fraudulent telemarketing sales presentations are actually carefully scripted pitches designed to trap the unwary in order to close a sale by whatever means necessary. You will discover that when it comes to making a buck, an investment fraud swindler's driving force is greed and that they they have an uncanny talent for sniffing out the same vice in others who, in their desire to get rich quick, are all too eager to put their trust and their money in the hands of unscrupulous schemers. Society will forever underestimate the ingenuity of people who make their living by fast-talking other people out of their money. Career swindlers are very good at their work and know just how to snare even the most reluctant or intelligent person. Bunko artists, grifters and conmen often have a charisma which can mask the fact that they are malignant narcissistics who like to feed on the insecurities and perceived stupidy of the naive and weak. They also know full well that people who are down on their luck are desparately easier to manipulate, and yet they will never show any feelings of guilt or remorse when they use all manner of trickery and deceit to put those people further into debt. They will gleefully strip victims not only of their hard-earned money, but also of their dignity. Some are more than willing to take a sickly victim's last dollar, the one reserved to keep an oxygen tank flowing. If they happen to give it any thought whatsoever, which is rare, they usually justify their immoral actions by suggesting that victims deserve their fate for being stupid enough to fall for it. Professional scammers take great delight in pulling the wool over the eyes of any investor who is 100% confident that he or she could not possibly be hoodwinked. It is, however, more than clear that many well-educated and intelligent people have fallen for the slick offers of these sophisticated criminals. In fact, many large firms have had their secure computer systems infiltrated by convincing, but deceptive, social engineering phishing techniques. Doctors and lawyers are especially vulnerable to convincing investment offers. Fraudulent sales callers are skilled liars and experts at deceit. Their financial success and drug habit often depends on it. Many who work in organized call centers or boiler rooms are coached to say whatever it takes to get your money while they continue to make hundreds of repetitious calls, hour after hour, day after day, continually honing their skills. If some pitch works on ten people, then one hundred, you can be sure it will be used to lure thousands to their misfortune. Skilled, but dishonest, salespeople, often with years of experience selling both acceptable and/or dubious products and services over the phone, pitch opportunities that may sound legitimate, but are not. They are extremely good at sounding as though they represent reputable businesses when they offer up various "can't lose" investments or business and employment opportunities. Never, ever, assume you'll know a phone scam or in-person investment fraud offering when you hear one. Telemarketers get paid by generous commissions, living by the proposition that whatever brings in a dollar is permissible and that all income is pure profit simpy because the only thing they offer in return for your cash transfers are false promises. An aggressive telemarketer in an offshore boiler room can make well over $450,000 in a single year while the head of such an operation can make many millions more each month. Statistically, many kingpins seem to reside in Florida. At least that is where most of the litigation attempting to shut me down originates. Scam operators just love to flaunt the spoils of their massive multi-million dollar deceptions. After spending as much as physically possible on luxury toys, such as Ferraris and Jaguar sports cars, fully-equipped mansions and casino junkets, they generally try to hide the excess in offshore accounts. No matter how confident you might still be, believing that you will remain impervious to any of their siren calls or convincing offers, do not assume that your friends or family will avoid becoming a victim of some kind of scam. For they are just as certain to fall prey to some financial trickery or malfeasance, as you will eventually, even if you are old and dotty when it happens. There is a scam for every victim at any stage of life, young or old. And never assume that you will ever be able to recover what you or your parents have lost, or even begin to see any restitution, because when these con artists are brought to justice, which is seldom, it is often impossible to recover anything to compensate their victims. This is often because most of their money has already gone to purchase recreational drugs and sexual debaucheries, or to support an extravagant lifestyle. It's also because they have figured out a way to screw you over twice, which happens the minute you hire a lawyer to go after them. Their money, which was once your money, directly or via lost inheritance, is long gone, hidden in trusts, gold bullion or untouchable real estate. Anything you spend on lawyers is almost certainly just as lost, as if you sent it straight to the scammers, for all the good it will do. They know the game and all the odds are in their favor. Don't even try to play their game, for they will win every time. Never assume that reporting fraud to the authorities will stop any scammer. Many are overseas, confident that your local authorities don't have the resources to track them down. Even in your own country, the average white collar criminal is no more deterred by stringent securities laws than the hardened felon is by lengthy prison sentences. In fact, many telemarketers already have an extensive criminal history, including convictions for assault and narcotics offenses. These thugs, who contribute nothing but harm to our society, choose to satisfy their greed by bilking others instead of doing an honest day's work. May the fleas of a thousand camels feast upon their armpits. Those who hire them to run their boiler rooms are more than willing to pay hundreds of thousands to lawyers to silence detractors, like myself, or defend civil suits by the government that will, at best, incur a fine much smaller than the money they steal from vulnerable victims. You see it every day with large corporations and banks who poison you with bad products or improper advice. The sad truth is that white collar crime pays very well and carries no real consequences, except for the victims. Your only defence against such a large and unstoppable force is a full understanding of who is out there waiting to rob you blind and what they will say to win you over. While people routinely spend hundreds of dollars, and years of reading, learning how to make money, few expend any time or effort learning how to keep it. Please, do yourself a favor and spend just a few days on this site learning how not to lose any of the hard-earned money you have now, or might acquire in the future, to scammers intent on taking every last cent of it. www.worldwidescam.info - Exposure of money-making pyramid scheme opportunities. www.quatloos.com - Exposure of investment schemes and scams. www.fraudaid.com - Fraud victim advice. 419 Coalition - original private resource on Nigerian scams. John T Reed - Seminar scams. Frauds and Scams - run by former enforcement official unafraid to tell it like it is. Diligizer - Sadly gone now, but was an excellent forum dealing with high-yield investment schemes. Visitors who write in with personal stories or provide details of current or past offenses will have attribution shown unless they request otherwise. I really appreciate it when people send in news stories and press releases about the sort of scams I cover. It keeps my info current and saves me a great deal of time researching. To ask a question or tell your story of victimization, e-mail me as below. For an even quicker answer first try the FAQ section. Please cut and paste the email address then replace the (at) with an @. It is the way I slow down spammers. Sorry for the inconvenience. I try to read and use all submissions, but may not have time to personally answer all letters. Here is the author's Wikipedia page. The book is ISBN 0-9687133-0-0 has 436 pages and is available for $29.95 or less. Just click the book cover image below to get the paperback or ebook from Amazon. Reading a paperback in bed is far easier without a monitor on your chest. You will help to support a decade of research and ongoing expenses. You've likely learned a valuable and worthwhile lesson already, after only a few pages. Any revenue helps restrict the need to charge for site access and gives credit where it is due. While the internet is great for instant research, it is poor for enjoyable, lengthy reading. If I have saved you thousands of dollars in potential losses, surely it's worth the price of a single book. A scammer often earns more in one sting than I do in a year. Support the battle to stop them. It makes a great, but subtle, gift for your parents. Help avoid losing your inheritance to scammers. You can donate it to your local senior's center, police department or library. The big picture regarding scams makes far more sense when read as I meant it to be, not just randomly piecemeal. It's a great coffee table conversation piece. Amaze your friends with your fraud awareness acumen. Still not convinced? View a sample of "Crimes of Persuasion" online at Google Books.